Yesterday was a painfully cold day, with winds that rushed through every little gap in my clothing and chilled my core. I pulled my coat tight and cursed winter, shouting to my companion that I have had enough of it already. On the bright side, however, it was also a notably sunny day. Not a cloud in sight. I took advantage of the warm afternoon light to photograph these broiled grapefruit beauties while Cookie napped in front of the space heater. Grapefruit, when broiled with a sprinkling of sugar, caramelizes and complements its inherent bittersweet flavors. Though this cooking method is as simple as can be, the broiled grapefruit would make quite an impression at brunch, served warm and radiantly pink. Don’t limit the preparation to special occasions, though; broiled grapefruit could brighten any bleary, wintery day. I turned mine into a more substantial meal in itself by adding a side of honey-sweetened goat yogurt and a handful of gingerbread granola (recipe forthcoming). I recommend it. Stay warm, friends! Simply prepared grapefruits, broiled with a sprinkling of sugar, are a beautiful, light brunch option. 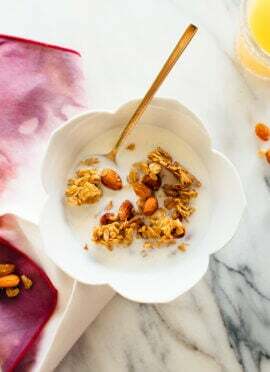 Serve with honey-sweetened yogurt and a handful of granola for substance. Preheat broiler. Make the bases of your grapefruit halves flat so they don’t wiggle around: slice off about ¼-inch of the peel on the base end and the stem end of each grapefruit. Then slice each grapefruit in half, parallel to your initial cuts. Place the grapefruit halves face-down on paper towels for about five minutes to absorb excess moisture. In a small bowl, mix together the raw sugar or brown sugar (I used a mixture of both) with a sprinkle of ginger and cinnamon and a dash of salt. On a rimmed baking sheet or a 13×9-inch glass baker, place the grapefruit halves face up. Sprinkle each halve liberally with the sugar mixture, using about 1 tablespoon per halve. Broil for 7 to 10 minutes, until the sugar is melted and turning a deep amber. 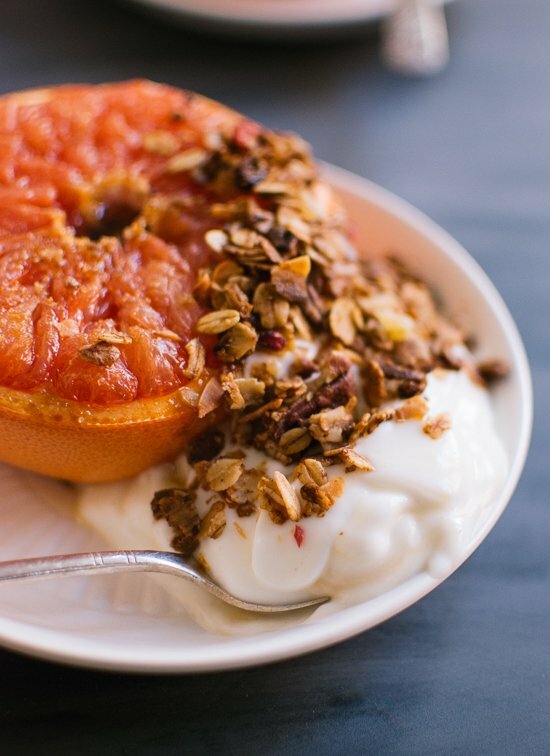 Let the grapefruits cool for at least a few minutes; serve warm or at room temperature with a big dollop of yogurt (swirl in honey if you’d like) and a handful of granola. Recipe adapted from Bon Appetit and influenced by The Year in Food and Joy the Baker. For a crackly, caramelized brûlée topping, use a culinary torch (see Bon Appetit for the method). Stunning photos, Kate! Well done! I love your healthy recipes! They are such an inspiration. I used a brulee torch for the first time at work the other day and now I REALLY REALLY want one to try doing this with. I have a broiler, but I mean really, torching grapefruit would be too fun. 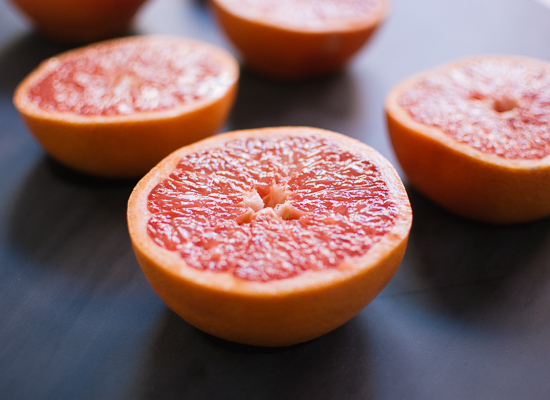 So pretty, grapefruits always remind me of my grandparents – they would eat one plain every morning, though your broiled version looks like something I’d love! That broiled sugar topping is the best. Seriously. Eating this would be like eating dessert for breakfast! Never a bad thing. I wish I could send you some of the amazing weather we’re experiencing here in Montreal. I’m not used to it, actually… I keep thinking it’s going to be -40C every time I step outside… and it’s not. So strange. My Mom used to make us broiled grapefruits ALL the time! I’d totally forgotten about it until I saw your post in my reader this morning. Well done. Totally going to make this! What an awesome breakfast idea!! I love making broiled grapefruit! I remember once, a long while ago, seeing a recipe for broiled grapefruit, and thinking it was a great idea. I really wanted to make it, but never quite got there. Now that the markets are brimming with fresh citrus, I’m just going to have to pick up a few grapefruits and make this tonight. Your photos are beautiful, and I love the garnish of granola. I can never say no to that irresistible crunch! Thank you, Jodye. I hope you’ll pick up some grapefruit at the market soon and try it broiled! These photos are beautiful Kathryne! Especially love that last one, and that each grapefruit halve is bursting with a little sugar top. I’ve been drinking my grapefruits lately…with Greygoose. haa can’t beat it, it’s been my drink all week. Love to you babe! I was going to ask you, since you seemed to have broiled quite a few grapefruit in the photos, how they do left over as I would be making them just for myself. Good question, Gayla. I preferred the grapefruit fresh from the oven, but they did keep in the refrigerator for a few days. I love broiled grapefruit! That sweet and sour mix is perfection. I never thoguht to top it with yogurt and granola. Next time I make one I am definitely adding those two! Definitely try it with yogurt and granola next time! They all go together wonderfully, if I say so myself. I had broiled grapefruit for the first time a few months ago. SO good. Thanks for the recipe! Broiled?!?!! This just blew my mind. I picked up some small, heavy grapefruit at the grocery store yesterday (maybe those Texas ones?) with intense fuchsia blush on their skins. And just like always I thought of my husband’s mom…when I first met her she’d describe how her very formal German family would begin their meals with broiled grapefruit when she was a little girl. 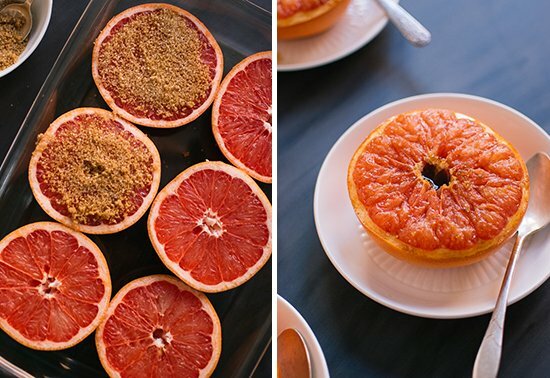 It sounded so strange to me, but I had no idea how much I’d grow to love broiled grapefruit! I didn’t realize that broiled grapefruit is a German thing. Fun to know! Thank you for commenting, Karen. Your blog is lovely as well. Just gorgeous Kathryn. Driving to the store the other morning my car registered -5; very cold for the the PNW! 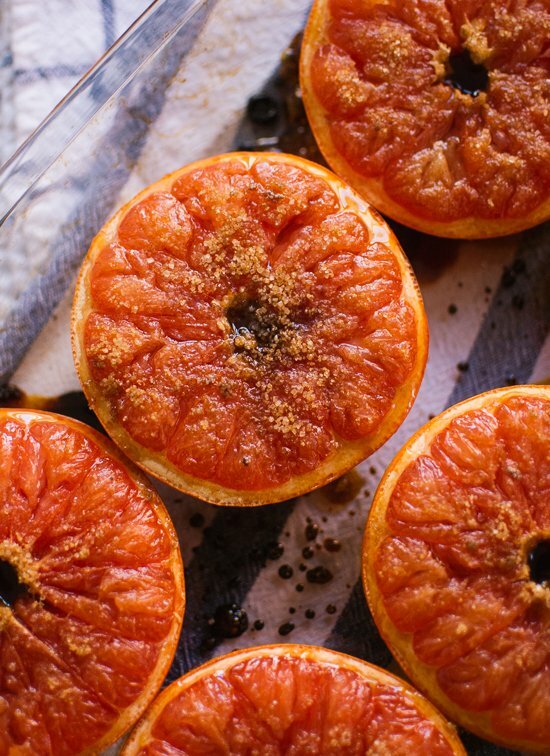 These broiled grapefruits look like summer flowers – just the thing to brighten a wintry day. 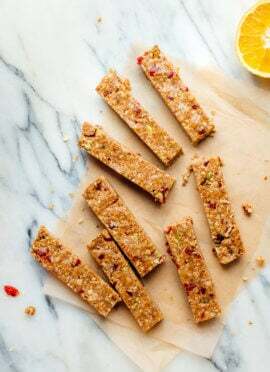 I do this was passion fruit too – the crunchy sugar topping works so well with the punch of citrus fruit. Such a great idea and totally in love with your photos! This is so my kind of dish! I’m sorry it’s been so cold- come visit L.A.! Stunning pictures too. I have broiled grapefruit before and it is soo yummy. The step where you let a paper towel absorb the excess moisture is good. I have never done that, but I think next time I will try. Thanks for the tip! I love broiled grapefruit! Great recipe! 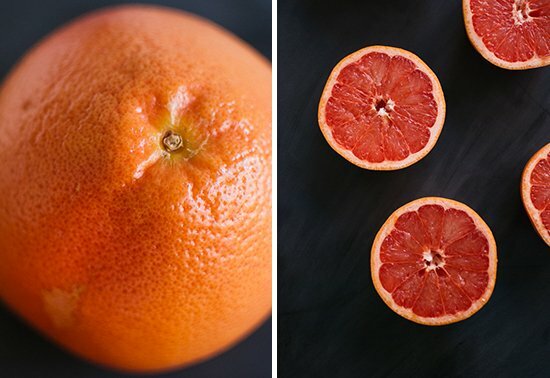 I’ve been on one hell of a winter-citrus kick lately (grapefruit-beet salad, grapefruit olive oil cake, for example) and this looks like I simply must make it! What a smart way to warm up on a cold winter night. As always, your photos are spectacular. Grapefruit olive oil cake sounds amazing! Hope you’ll try broiling them soon. Huh – I never thought about boiling grapefruit. That’s brilliant! I’m not the biggest fan of grapefruit, but it seems like it would work just the same with oranges. I think it would work just the same with oranges, Michael, and I bet they’d be delicious broiled. Please let me know if you give them a try. Oh my goodness. This looks SO good. Definitely trying this stat. You’re welcome! I’d like to try broiling other fun citrus, like blood oranges. I think they’d be delicious broiled as well. I’ve always wanted to try broiled grapefruit and I keep forgetting to buy them. Now I’m kind of glad I waited because I love the additions of cinnamon, ginger and yogurt! I want to try broiling blood oranges and other fun citrus varieties next. Yogurt pairs so nicely with the fruit. Just bought grapefruits to make this for a Monday morning pick me up, can’t wait to try! 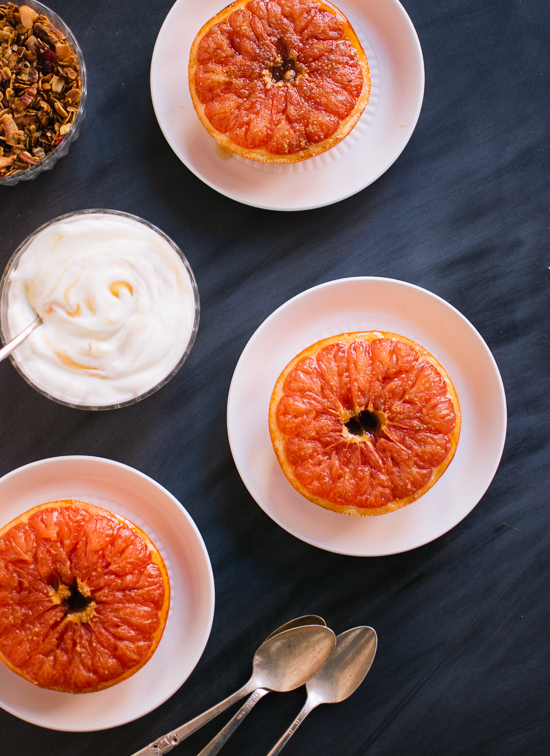 Hope the broiled grapefruit got your week off to a great start this morning! This somewhat resembles a grapefruit “brulee” my mother in law made for me once. 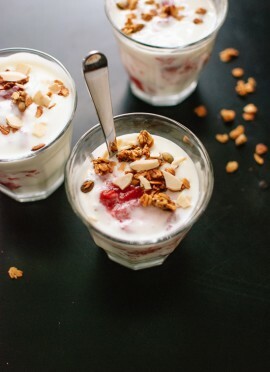 I love Greek yogurt and granola, so this looks like a complete winner for me! Those bone chilling winter days are the worst. A couple of days last week we had a streak of negative temperatures and it was horrible. Since I live in the top floor corner unit, with enormous windows, my apartment was 57˚ inside. Needless to say, I was wearing my down parka around for those three days. A double layer socks. Anyway, grapefruit brulee is my fav. I need to try the ginger + cinnamon + brown sugar concoction next! But first I need to get my hands on some grapefruit. PS – can you tell I’m playing blog catch up? I neglected my reader for far too long. Glad you survived those negative temps, Ashlae. It’s been terribly cold here in Kansas City the past few days, too. I thought my hands were about to freeze off while I was making the short walk to the coffee shop this morning. Can you tell I’m playing comment (and blog and email) catch up? I’m so behind on everything! Hi Kate, is that granola recipe available yet? Hi Bonnie, I’m sorry for the delay on the recipe. I hope to make another batch to photograph this weekend and post it next week or the next. Thank you for your patience! Thank you, Alex! I’m really happy to hear that you’re enjoying my recipes. This was really delicious! Topped with the yogurt and granola I loved the sweet/tart soft/crunchy combinations. Maybe I’m clumsy, but I found it difficult to eat, so next time I’ll section the grapefruit before broiling. Will definitely make again. It is totally difficult to eat grapefruit with a regular spoon! Sectioning beforehand is a great idea. I bought a grapefruit spoon from Crate and Barrel for about five bucks that works well for scooping out each section when you’re ready to eat it. Absolutely beautiful and so simple! I whip these up for my kids for breakfast on weekdays, and they are always met with a warm welcome. The pictures are gorgeous too! Thanks for sharing. Thank you! It’s great that your kids enjoy grapefruit. I’d better get my fill before citrus season is over! Oh yes. Making this with lunch! I LOVE grapefruit but have never thought of broiling them before. I am absolutely going to give this a try! your recipe makes my day! Yes! Glad you enjoyed the grapefruit, Emily. I want to try mine with chia seeds next time. Awesome! Happy to hear it, Caroline. I have found ur blog when I was googling for a borscht recipe. Me and my husband liked it very much! It reminds us of our parents cooking! That is great! Thank you, Paper.